G-force space vessel will need a lot of fuel. 1. Heat it to steam, then superheat it to an ionic state (plasma). Bear in mind that we need some substance that we can readily turn into plasma and thus accelerate as charged particles through an onboard particle accelerator into a significant fraction of c, speed of light. Once these particles are expelled, the spacecraft will gain slight momentum in the opposite direction. Water may not be the best substance for this purpose, but it has a lot going for it. 2. Steam turns turbines and turbines can generate electricity which will be needed not only for life support and onboard equipment, but the propulsion system will require the most power. Thought experiment assumes propulsion system as a series of accelerator magnets increase ion's velocity, bends their path, and focuses them into a tight beam for final exhaust. Collective momentum of these numerous particles combine to propel vast spacecraft forward at g-force. Those particles might be component water ions. 3. Emergency source of oxygen. Hopefully, spacecraft will make good use of onboard trees to generate most oxygen; if trees don't supply enough, life support system may have to extract oxygen atoms from the water molecules. 4. Store fuel between inner and outer hulls. This is similar to a typical aircraft design where fuel is stored in the wings; so, this isn't much of a stretch. This would also provide additional shielding against inflight radiation, an added benefit. 5. Helps plants grow. Hopefully trips won't be so long that plants are mandatory for interplanetary trips, but it'd be nice to bioengineer them into the onboard environment. 6. Drinkable. It's always nice to have water to drink. After breathable air, water is mankind's most necessary commodity. 7. Perhaps the most relevant quality of water and perhaps other fluids is their abundance in space. For example, if Oort clould does indeed have numerous comets; it's conceiveable that we might be able to retrieve some. While the majority of Earth's surface is covered with water; however, shipping vast quantities of it into space might be challenging. Consider following extracts from works by two distinguished icons of the physics world. First is an extract from a Natural History article by Dr. de Grase Tyson, distinguished astrophysicist and director of New York's Hayden Planetarium. Following is an abstract of an online work by Dr. Louis Frank, physics professor and author of the Big Splash. Water, water: did cometary impacts deliver Earth's entire oceanic supply? Of all molecules with three atoms, water is by far the most abundant. And in a ranking of the cosmic abundance of elements, water's constituents of hydrogen and oxygen are one and three on the list. The Apollo astronauts carried with them all the water and (and air and air conditioning and everything else they needed) for their journey to and from the Moon. However, future missions may not need to bring water or derived products. Evidence from recent lunar missions (i.e., Clementine in the 1980s and more recently from the Lunar Prospector) strongly indicate frozen lakes deep within craters near the Moon's poles. The solar system contains plenty of comets that, when melted, could make a puddle the size of Lake Erie. If the ice were well mixed with solid particles (as it is in a comet), it could survive for thousands and millions of years in the extreme cold at the bottom of the Moon's deep polar craters. Lunar outpost on the Moon, we would benefit greatly from locating it near a frozen lake. Obvious advantages come from having ice to melt, filter, and drink. Keep the rest of the oxygen for breathing. If the moon got pummeled with all these water bearing comets, you might expect the much bigger target, Earth, to have been hit, too. Given Earth's larger size and stronger gravity, you would expect it to have snagged even more comets. As a matter of fact, the impact rate of comets at the time is suspected of having been high enough to account for Earth's entire oceanic supply of water. But controversies remain. Water in comets is high in deuterium, a hydrogen isotope with an extra neutron. If all the water of Earth's oceans came from comets, then the comets that hit Earth during the early history of the solar system must have had a somewhat different chemical profile than the ones we observe today. A recent study by Dr. Louis Frank, Univ. of Iowa, suggests the Earth's upper atmosphere regularly gets slammed by house-sized chunks of ice. These interplanetary icebergs swiftly vaporize on impact with the air, but they nonetheless contribute to Earth's water supply. If the impact rate of the ice has been constant over the 4.6-billion-year history of Earth, then this source of water alone could account for the world's oceans. Water vapor is also out-gassed from volcanic eruptions, so Earth has had no shortage of ways of getting its supply of surface water. Dr. Neil de Grasse Tyson, an astrophysicist, is the Frederick P. Rose Director of New York City's Hayden Planetarium. Thousands of comets the size of small houses bombard the Earth's atmosphere all day, every day, and may account for all the planet's water, according to a University of Iowa physicist, Louis Frank. Frank captured images from cameras aboard NASA's Polar satellite. He first presented his small comet theory in 1986, and wrote a book, but some colleagues have been slow to accept it. "This relatively gentle 'cosmic rain' -- which possibly contains simple organic compounds -- may well have nurtured the development of life on our planet," Frank said. The images show what Frank describes as small, loosely packed snowballs encased in shells. As they approach the Earth's atmosphere, the comets break apart, producing clouds of water. They do not contain the dust and metals of bigger comets. "They don't have those things that glow so brightly that you would see," Frank said. "If they were built like big comets, then you would see these fantastic glows in the sky. ...resulting in about one inch of water every 10,000 years, according to Frank's theory. Over the course of billions of years, even this minuscule amount of water would be enough to fill all of Earth's oceans. The Polar satellite, which orbits high above the Arctic Circle, tracked the snowballs as they disintegrated. Using a filter that detects visible light emitted by water molecules, Frank determined the snowballs to consist mainly of water. According to data provided by the Polar satellite, the snowballs are no danger to people on Earth or astronauts, spacecraft or airplanes because they break up at altitudes from 600 miles (965 km) to 15,000 miles (24,140 km). The National Aeronautics and Space Administration is backing Frank's claim, with some reservation. "NASA is not yet convinced that we know how many of these, and how much they weigh, and how much water they're providing to Earth," said the agency's Steve Maran. "But it's obvious to us there are dark spots in our satellite pictures, and these are incoming water-bearing objects." Scientists have long theorized that billions of years ago, large comets slammed into the globe, seeding it with minerals and chemicals. Correspondent Ann Kellan and Reuters contributed to this report. Louis Frank, van Allen Professor of Physics at University of Iowa, wrote the Big Splash, published in 1990. Following text is based on Dr. Frank's online extract. August 3, 1981, a Delta rocket lifted off from Vandenberg Air Force Base carrying a pair of NASA satellites, both known as Dynamics Explorer, into elliptical orbits. One orbit circles Earth's poles of Earth at an altitude from 350 miles to 14,500 miles. I was responsible for three instruments on the satellite, one was an ultraviolet (UV) camera, built and operated by my colleague, John Craven. This satellite examined Earth for certain light emissions invisible to the naked eye. I and other scientists hoped for further insight into the nature of the auroral lights in Earth's polar atmosphere .... 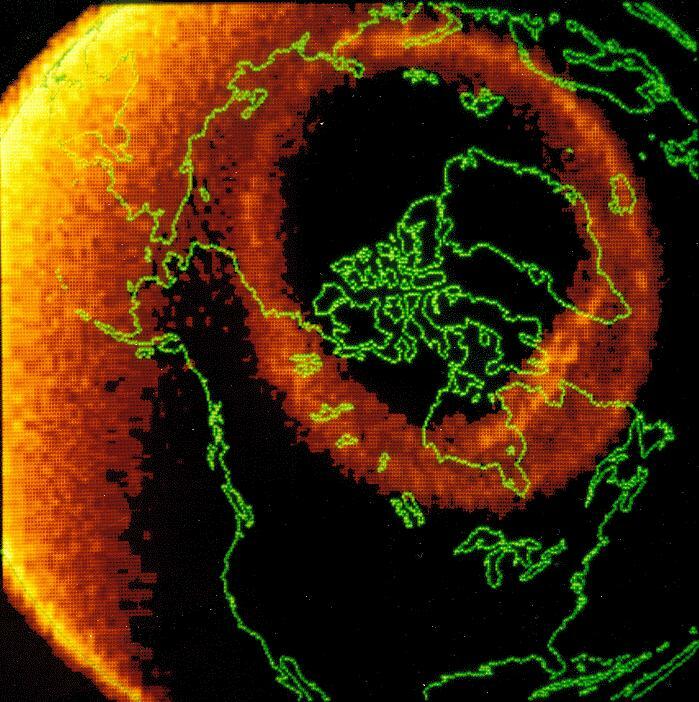 I was particularly interested in getting the first global pictures of Earth's aurora and I was not disappointed. The pictures sent back from the ultraviolet camera on the satellite were spectacular. The remarkable auroral crowns encircle the poles of Earth, while the planet's dayside looks like a bright ball illuminated by a flashlight. This bright feature is known as the dayglow. Dayglow is produced by the interaction of sunlight with the atomic oxygen present in Earth's upper atmosphere. The ultraviolet light emitted by this dayglow is not visible to the naked eye but is within the range of the satellite's specially-designed camera. The emissions it captures are transformed into a normal photograph. Dark Spots. 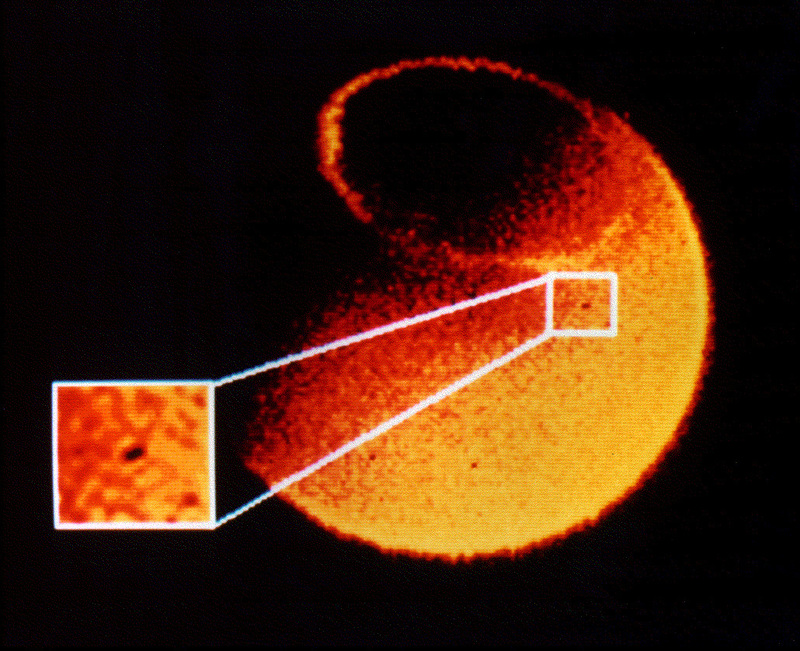 In late 1981, we noticed that our images contained unexpected, annoying dark spots. They were like flies walking across a television set. They were there from the start, on the very first images. Strictly speaking, these spots were areas of greatly reduced brightness. In other words, there seemed to be holes in the dayglow. There is no question about who saw them first. Everybody saw them. We would give talks and the black spots were there on the images for everyone to see. And everyone assumed they were noise, random fluctuations in data due to chance. Sigwarth, Craven, and I pondered the question and concluded there must be an anomaly in the camera's electronics to occasionally put these annoying little black spots in the image. Perhaps this was due to transmission problems from the satellite. Like the image on a home computer, satellite pictures are each constructed of a large number of pixels, each composed of eight bits. So perhaps some pixels were not transmitted down properly. Whatever the source of the noise, I did not relish spending my time tracking it down. Thus, I gave the job to my trusty undergrad, Sigwarth. He was tempted to simply remove the spots from the images and get on with the search for gravity waves. However, you must have a good reason to remove data from a study. We needed to show that the spots were either detector noise, or produced by electronics on the spacecraft, or generated by computers on the ground. Only then, could we eliminate the spots from the processed images and get on with our work. Sigwarth worked very hard trying to solve the mystery. From time to time, he would come into my office and say he was not having much luck. At the end of 1982, and Sigwarth was still unable to trace how the holes appeared on the images. Camera Problems?? One possibility was that a light counter on the camera was failing. Every other pixel in the satellite images is produced by an entirely separate set of electronics. The counters take turns producing the dots that comprise each image. So, Sigwarth had separated the data produced by each counter. But when he examined the data he saw that both counters were observing spots in the same sequence and at the same rate. This told us the counters were not dropping bits. We knew that it was nearly impossible for two counters to malfunction in exactly the same way. Transmission Problems?? We also eliminated the possibility that these annoying little blackspots were caused by errors in radio transmission from the spacecraft. We checked the entire system from the time the data left the instrument, passed through the satellite itself, traveled down to the ground, and was relayed to us. Because the instrument regularly transmits fixed words, or fixed bit patterns, we could check to see if any transmission errors were occurring. We calculated that dark spots due to telemetry noise would appear once in every 200 images. But these spots appeared in the images almost a thousand times more often than expected. Sigwarth and I analyzed over 10,000 images and learned a good deal about the black spots. By counting the spots in our images, we estimated the rate at which these objects appeared. This was the simplest measurement to do. Since we saw ten holes per minute on Earth's daylight side, we doubled that figure to estimate twenty per minute for the entire face of Earth, an alarming number of objects. To explain just how these "meteors" could cause holes in the atmosphere's screen of atomic oxygen, we entertained three possibilities. The first and simplest explanation had the meteors laying a blanket of material over the atmosphere, preventing the light from getting through, and creating a black spot in our images. Perhaps atomic oxygen up there was being depleted by some special chemical process. However, we could not think of any chemical reaction that could get rid of the atomic oxygen so quickly nor any that allowed the atmosphere to restore itself as rapidly as we observed in our images. A third possibility involved a catalytic reaction of the sort that takes place in the catalytic converter in your car. Could some small amount of catalyst be converting the atomic oxygen in the atmosphere into molecular oxygen and producing the dark spots in our images? It was not likely, as we were never able to identify any such catalytic agent. Since each spot actually moved across the face of Earth, this indicated an object that prevented light from passing through it. It had to be big and blackening out the ultraviolet light at a certain wavelength. It could not be an atom. It could not be a rock. It could not be anything thrown up there from down here. It had to be a common molecule in the solar system that absorbs at the right wavelength. The only such molecule is water, and water just happens to absorb at these wavelengths. There was no reason to look for anything exotic. Water, in the form of water vapor, fit the bill perfectly. This explanation posed certain difficulties, more psychological than physical. Object Quantity. When we calculated how much water we would need up there to produce a spot in our images, we came up with about a hundred tons. Anyone would tend to back off from such a large figure and initially we did too. Then we figured out how many such objects we needed to account for the holes in the images we observed over the course of the year. And it was not one, not a hundred, but ten million. There was the problem. One per year would not have been a problem. But ten million per year? Unfortunately, there was not much leeway in our numbers. Object Size. The size of the holes presented another problem. They were easy enough to measure. We knew the size of the area each pixel covered in our pictures and we knew the altitude of the spacecraft. But what looked like little dark spots on the images turned out, in reality, to be about thirty miles across. They could not be rocks because such large rocks would just smash the surface of Earth to pieces. Comets melting into water vapor clouds upon impact with Earth's atmosphere was the only reasonable explanation we could find. Many people said there had to be other explanations for the dark spots. But no one has ever come out with one. Satellite Parts. Early on, some engineers suggested "... satellite parts falling into the atmosphere". We quickly discounted this hypothesis. There are not ten million satellite parts out there. They are not thirty miles wide. Meteors. Earlier on, we noticed a correlation between quantity of image spots with the frequency of meteors falling to Earth. We were initially elated, but our elation disappeared after further thought. The objects were just too big and too numerous to be just another nice little geophysical fact with no real impact. Noise. Our spots did not come from noise which would appear at random all over the image. However, our black spots acted like objects in motion, not characteristic of noise. Thus, we ruled out noise and determined the spots to be real. The numbers were compelling. Ten million objects falling into Earth's atmosphere every year is an infall of material about ten thousand times greater than anyone had ever imagined. So, intuitively, the interpretation was difficult to accept. But intellectually, it was trivial; there was no other reasonable explanation. How could I be sure that I reached the right conclusion? Of course, one can never be completely sure, but I decided to examine my own data as skeptically as possible. I assumed my notion to be wrong, and I searched for just one piece of evidence to disprove my theory. A hundred pieces of evidence would not prove that they exist. But only one would suffice to show that they did not. So I sat in libraries and read about astronomy, about oceanography, about geology, one field after another. I could not find the one piece to disprove my theory. Thus, I decided to publish the findings, no matter what the consequences. I could not live with myself otherwise. It was just morally incorrect to withhold it from the scientific community.